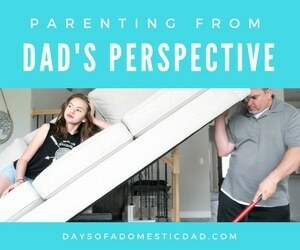 Disclosure: This is a sponsored conversation written by me on behalf of EVEREADY®. The opinions and text are all mine. If you have kids, you may have hosted a pajama party or two. We recently decided to have a Pajama Jam Party under a fort in our living room and EVEREADY® was there to light up the night. Using a downloadable party toolkit EVEREADY® and Scholastic put together, Colby and I enjoyed a night of fun with the girls. We baked, ate, laughed, and read books. You can find more resources on Scholastic that encourage reading under the covers with your kids! Discover bookmarks, printables, and even the chance to win a free book. Following a few tips for the perfect pajama jam party list below, our evening was quite a success! Pick a theme. We picked the book, Goodnight Moon to center our party around. The girls love listening to the book at bedtime so it made perfect sense. Make a plan. Colby wanted to make a super fort better than ever before. He decided the living room would be best. Then, with no school on Fridays, the girls picked Thursday night to party. Send out invitations. If your invite lists consists of people outside you home, plan on who you are inviting and send out those invites soon! Set the mood. In our case, the fort was perfect. 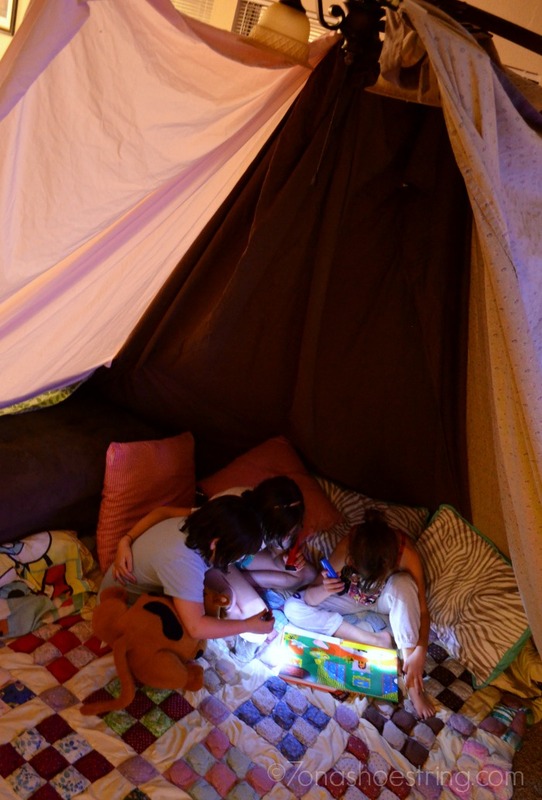 We turned the lights down and gave the girls each an EVEREADY® flashlight for the evening. A large quilt and every pillow we could find helped make the inside as comfortable as can be. Prep food. Every party needs food! The girls and I put together a basic pajama party menu so we could just get to the book and sleeping. Snacks were ideal for reading under the covers. Enjoy yourself! Don’t spend your entire time watching… be sure to get involved as well. You will be glad you did! 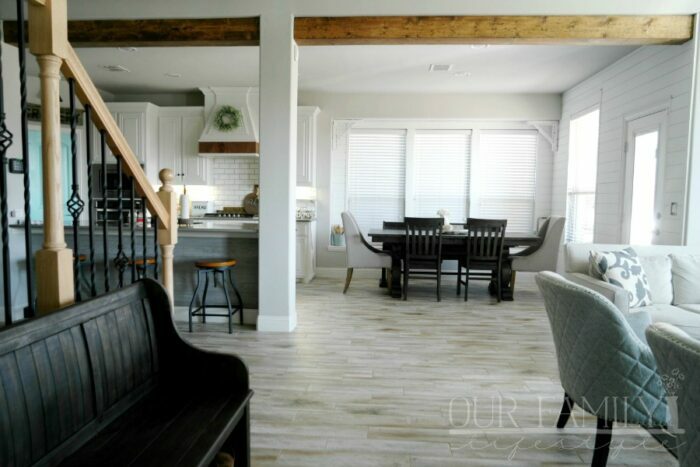 All of these tips can help you pull off a party in no time. After all, the party is about having fun… so make sure you do! 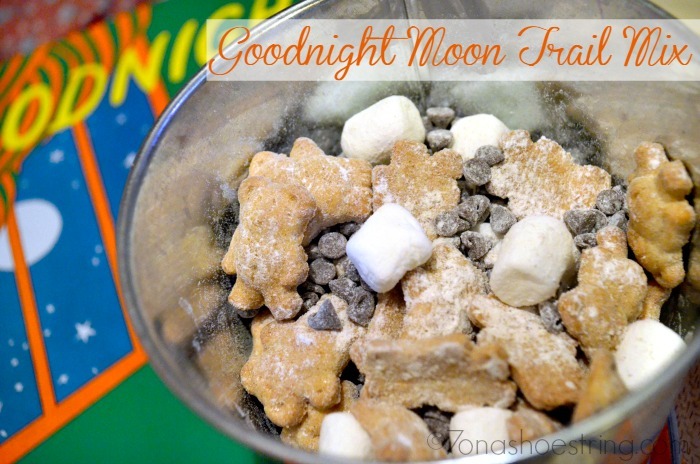 Mix equal parts of Teddy Grahams and mini marshmallows. in a bowl. Add mini chocolate morsels based on taste. Sprinkle mixture with confectioner’s sugar. Cover bowl and mix trail mix. But that wasn’t all. We also decided we want Moon Pies to match our Goodnight Moon theme. They turned out better than I hoped… and were delicious. 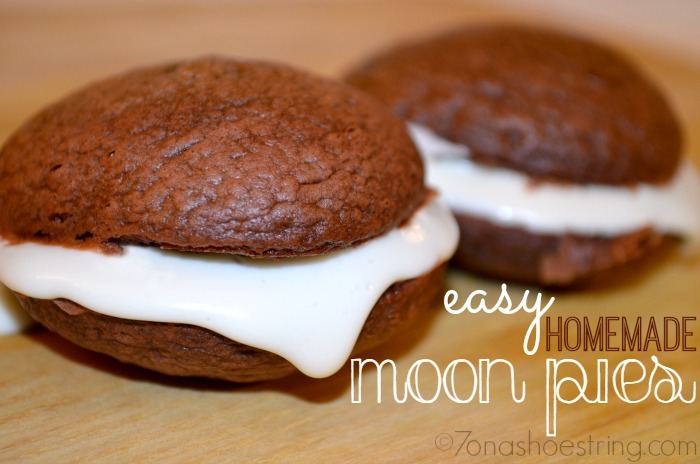 Hop over and get the moon pie recipe for your next party! After reading Goodnight Moon a few times, along with other favorites, it was time to settle in for the night. Oh how I love sharing my passion for reading with my kids. 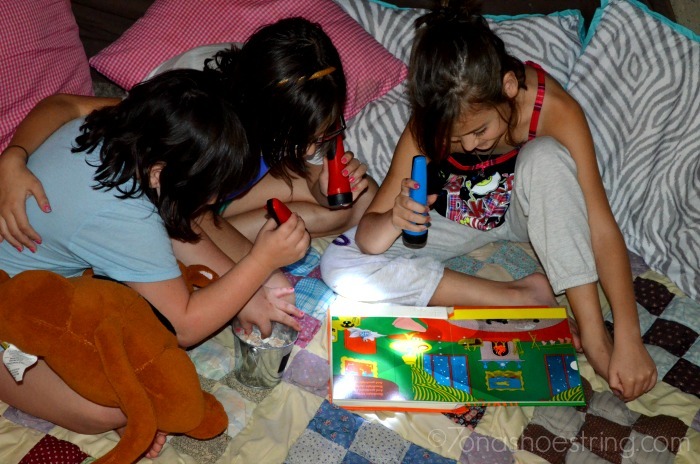 The girls even wanted to share their own stories before going to sleep as they passed the EVEREADY® flashlights around the fort. The laughs, smiles, and bedtime hugs were worth every minute.